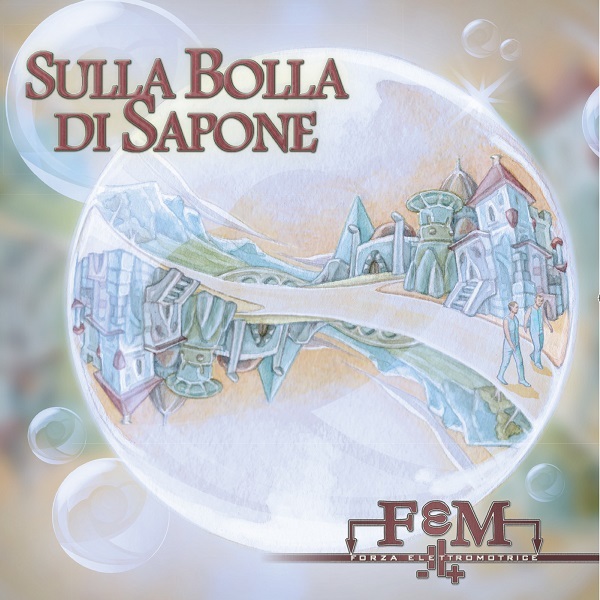 Sulla Bolla de Sapone is a concept album based on a short story, On the Soap Bubble, written in 1887 by German author Kurd Lasswitz, the father of German Science Fiction. The 15 tracks (instrumentals and songs) on this new album speak to different parts of this story. The FEM Prog Band, aka Forza Elettro Motrice, is the Italian quintet of Giacomo Balzarotti (vocals), Alberto Citterio (keyboards), Paolo Colombo (guitar), Marco Buzzi (bass), and Emanuele Borsati (drums). They have been working hard at recreating 70s progressive rock and Sulla Bolla de Sapone is their debut album, though they released the EP Epsilon in 2012. Their music is mostly progressive jazz reminiscent of Premiata Forneria Marconi with one or two Zappa references, but in their more melodic moments, I hear Genesis and Le Orme elements as well. For my tastes, FEM excels when their music is toned down a bit and not so energetic. Many of the songs segue seamlessly from one to the next, so the album is closer to one piece of many movements than 15 discrete songs. And there is a surprise with track 11, “Il Peso della Conoscenza.” All of a sudden in the midst of the prog-jazz, there is a strong resemblance to Catherine Ribiero and Les Alpes, in the music, not the vocals of course. Concept albums are difficult, and I would say that roughly 50% of the tracks are worthy of note, with the later tracks being the best. The closing track “E il Mondo Scoppierà” is especially excellent. The bottom line is that FEM is successful in achieving their goal of recreating the 70s and making it relevant with today’s music.